This chicken fricasée recipe really does do a chicken breast justice. We cooked it in France with poulet de Bresse, one of the fanciest of all chickens, but just use the best you can find. Lovely with new potatoes roasted with olive oil and rosemary. If it’s not artichoke season, you can substitute frozen artichoke bottoms or use those little artichokes in jars. 1. If you have time, brine the chicken breasts to keep them plump and moist. Meanwhile, tackle your artichokes. This is our special method. Cut off the stalk about 1cm from the globe. Peel off the outer leaves, rubbing on lemon juice as you go to stop the artichoke going black. 2. When you reach the heart, cut off the top about a third of the way up from the base and discard the top two-thirds. Take a melon baller or a spoon and dig out the choke – the fuzzy hairy centre. With a small knife, carve off the outer skin of the heart, then rub it with lemon juice. Prepare the rest of the artichokes in the same way and cut each one into about 6 slices. 3. Bring a shallow pan of water to a simmer and add a good squeeze of lemon juice. Add the artichoke slices and simmer them for about 5 minutes, then cover the pan and set aside. 4. Blot the chicken breasts dry on kitchen paper, place them between a couple of pieces of cling film and beat them out briefly. Spread the flour out on a plate, season it, then coat the chicken in the flour. 5. Heat half the butter and a tablespoon of oil in a heavy-bottomed frying pan with a lid. Add the chicken and cook for a minute or so until golden, then turn it over, put the lid on the pan and cook gently for 10 minutes. 6. Remove the chicken, wrap it all in foil and leave it to rest for 10 minutes. 7. Heat the rest of the butter and oil in the pan and gently cook the shallot for about 5 minutes until translucent. Add the garlic and cook for another minute, then add the artichokes and mushrooms and cook them until they start to colour. Pour in the wine and a tablespoon of lemon juice and cook until the liquid has reduced by half. 8. Remove the pan from the heat and gently stir in the grated zest of one lemon and the herbs. Divide the artichokes and mushrooms between 4 plates, top with a chicken breast and drizzle over the resting juices. In this BBC TV tie-in book, the Hairy Bikers present recipes from around the world that celebrate the most popular and versatile of ingredients: chicken & eggs! Following on from their many best-selling books, including THE HAIRY BIKERS’ MEAT FEASTS and THE HAIRY BIKERS’ PERFECT PIES, The Hairy Bikers return with another heart-warming and down-to-earth cookery book, perfect for all the family. THE HAIRY BIKERS’ CHICKEN & EGG is full to the brim with fantastic ideas for chicken recipes, as well as delicious egg-based puddings and starters. Packed with delicious recipes, invaluable tips and techniques to learn, this gorgeous collection of recipes is the Hairy Bikers at their best. 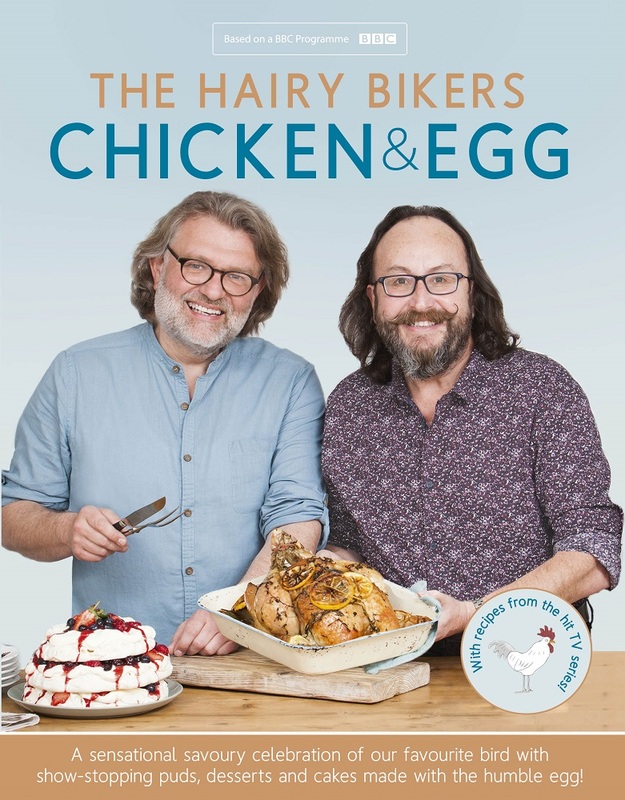 Recipes from THE HAIRY BIKERS’ CHICKEN & EGG by Si King and Dave Myers is published by Orion in hardback at £22, eBook £12.99.